Transportation in a fully-equipped vehicle and English-Speaking Official Local Guide. Discover Marbella, the sun-drenched Costa del Sol town of Marbella. 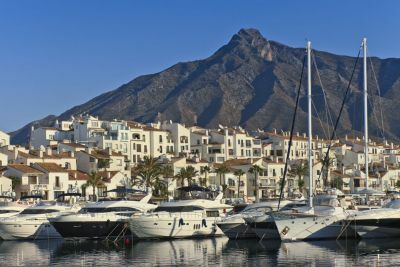 Explore Puerto Banus, known as Costa del Sol's playground for the rich that come here for the beaches, the beach clubs and the buzzing nightlife. Marbella is deservedly one of the Costa del Sol´s prime destinations. Its excellent climate, beaches, natural surroundings and its major sports complexes are just some of the countless attractions which this town on the Malaga coast offers. At the foot of the Sierra Blanca hills, on a beautiful bay, is Marbella´s historic quarter. A delightful layout which displays its typically Andalusian charm through neat whitewashed facades decorated with grilles and geraniums or the orange trees which spring up on every corner. Clear proof of the high quality of its infrastructure is Puerto Banus, one of the most emblematic spots in Marbella. Surrounded by exclusive housing developments, this famous marina each year welcomes some of the biggest and most luxurious yachts in the world..